We've all seen it in matches and videos, a player blasts an awesome shot and somehow in the bat of an eyelid their opponent get their bat to it and create an awe-inspiring reflex return to win the point. 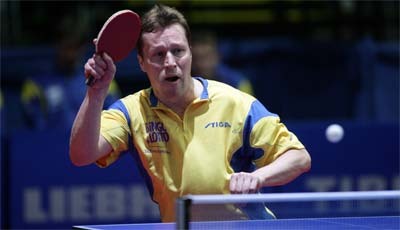 Reflexes are one of the most important things to have in a sport as fast as table tennis. One such player which is renowned for his quick hands and great touch is of course Jan-Ove Waldner, there are many amazing points from his career demonstrating his incredible reflexes in logic defying shots. So what kind of things can you do to improve your reaction speed? - Ball Coordination Drills: Any type of catch and throw exercises are great if done at speed. One I used to use with my junior players is the catch and throw reaction game. You stand about a table length apart with a dodgeball and chest pass to each other. You can pass straight forward or a little to the left or right to bring in some footwork. The rule is, to keep the pace, as soon as you catch the ball you have to throw it again, so it's more a quick catch and release. You can also underarm pass and spread the side to side range in order to get a good footwork workout too! One famously used by the Chinese National team involved a coach squatting down in front of a player and tossing table tennis balls left and right at close range. The player would have to stay low and try and kick the ball in a fraction of a second. - Vocal Recognition Drills: Another common one used by coaches is for players to react to changes rapidly on a set of vocal commands. One such example is a game where players start at a central point and have to move left, right, in and backwards mimicking table tennis footwork movements. A coach will stand at the front and call each command with players having to move as rapidly as possible. You can also use the same game for strokes, forehand backhand, loop, drive etc. Also to add a difficulty element you can change from vocal commands to visual by create a set of hand motions for each action. This way you improve your hand-eye coordination. - Other Sports and Games: Sports like squash, badminton and tennis can all help develop hand-eye coordination for racket sports. Even something like air hockey which you can play in an arcade can help with your reaction speed. Many sports have interchangeable skills. - Random Drills: Any random drills which don't involve fixed patterns will really help to improve your coordination. The classic is the random to backhand drill where your training partner hits anywhere on the table and you play to a fixed point. This improves your ability to react, you can also progress by increasing the speed of the block and also to counter-driving to make the difficulty higher. To add another element of difficulty you can do random topspin with both players staying close to the table and playing random but with short drive shots. This keeps the speed up and the reaction time low but also forces you to practice making decisions about your placement as well, adding another dimension to the already very little time you have. - Defensive Drills: Defensive drills are often overlooked. One great drill for building reaction speed and fast hands is to push long to the middle or backhand corner and allow your training partner to attack anywhere. Anytime a drill includes giving your partner full range over the table, it becomes a very difficult task to react, especially if they have a lot of speed or power in their shots. Developing close table counterloop will also help with your reaction speed. I will be preparing a blog on that in the coming weeks. - Multiball: The best thing about multiball is that it operates at a speed frequency higher than natural for a table tennis game. For that reason it is one of the great methods for increasing reaction speeds. The feeder of the multiball should constantly but slowly increase the speed to keep pushing your limits in order for you to continue improving your speed. Some of the Chinese players doing multiball are great examples of players reacting with ridiculous speed and precision. Above, Fan Zhendong does a random multiball drill with his coach. Notice the reaction time shrinks as the feeder stands closer to the net, this is also something you can build as you improve, start with the feeder closer to the back line and move them forward to shorten the reaction time. This speed Fan achieves is a pure result of physical conditioning, an insane number of multiball and training hours. So the biggest secret to improving your reaction speed is constant practice. Muscle memory and brain training are really the crucial elements behind reactions and hand-eye coordination. Wow wonderful very powerful thank you very much.